SEPnet’s Graduate Network (GRADnet) recently held its 4th networking evening to facilitate greater collaboration between industry and physics postgraduate researchers. Panellists including Simon Campbell of Selex ES, Phil Edwards of Weald Technology, Julie Barry of RIFT Research & Development and Jim Telfer of Hilger Crystals shared their views and advice on what physics graduates can offer businesses, what skills industry needs and what opportunities are available to physics PhDs. Students then networked with employers to explore potential jobs, research work or industry mentoring support. SEPnet helps students develop their employability skills in a number of ways and, during the evening, Greg Smith, physics PhD student at Kent, showed his video describing an investigation he would like to send into space. Greg’s video won him a week at the Yuri Gagarin Training Centre in Russia, sponsored jointly by Kent and SEPnet. The training week will offer Greg the chance to enhance his leadership, team building and communication skills. You can view Greg’s video here: Greg Smith, University of Kent – A solution to showering in space. This is to announce eleven PhD positions financed by the EU; first application deadline is next February15th 2016. Eleven PhD positions are now being offered by the new Horizon2020 (H2020) Marie Skłodowska-Curie Innovative Training Network (ITN) “Elusives”, www.elusives.eu (expected to finalize all confirmation procedures in January). The recruited Early Stage Researchers (ESRs) will work on Neutrino, Dark Matter and/or BSM physics; most of the positions are to work on theory/phenomenology, but for a few positions dedicated to experimental physics. Applications are now open for PhD studies in France, Germany, Italy, Spain, Switzerland and UK, with starting dates around the fall 2016. Could you please forward the announcement below to your network? This is urgent, as the first deadline for applications is 15 February 2016.Further application deadlines will be March 30th and May 30th, if positions are still available. 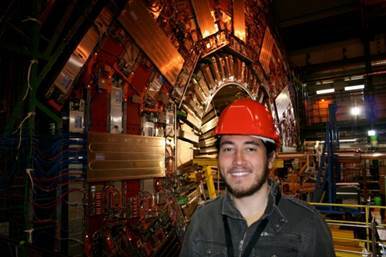 PhD research on Neutrino, Dark Matter and/or BSM physics. Eleven positions, first application deadline is next February 15th 2016. The Horizon2020 (H2020) Marie Skłodowska-Curie Innovative Training Network (ITN) “Elusives” www.elusives.eu(expected to finalise all confirmation procedures in January) is offering PhD positions in Neutrino, Dark Matter and/or BSM physics research, with starting dates around the fall 2016. The gross salary is about 3,110 EUR per month; complemented by additional 600 EUR per month corresponding to mobility allowance. Also possibly a family allowance of 500 EUR per month may be paid. The first deadline for applications is 15 February 2016. Further application deadlines will be March 30th and May 30th 2016, if positions are still available; nevertheless, the positions may be filled at any moment. All applications should be made through the web page www.elusives.eu. To mark Tim Peake’s momentous visit to the International Space Station, SEPnet and the University of Kent’s School of Physical Sciences recently launched their own space initiative. Physics students, Kieran Hashmi (Queen Mary University of London) and Greg Smith (University of Kent), have been selected to participate in a week’s cosmonaut training in Star City near Moscow. The opportunity, sponsored jointly by SEPnet and University of Kent, will enable them to develop their team building and communication skills using the same equipment as the real astronauts. Students from SEPnet partner universities were asked to submit 2-minute videos describing an investigation they would like to send into space. The winning videos were selected by a panel of 6 SEPnet partner judges. 2 runners up, Holly Stemp (University of Surrey) and Jonathan Bensusan Bash (University of Sussex) were awarded prizes of £500 each towards career development training.